Video abstract presented by Yona Mbalibulha. Objectives: This study was undertaken to determine the distribution of ABO/RhD (rhesus D antigen) blood phenotypes, prevalence of anti-D alloantibodies, and the risk factors for alloimmunization among pregnant women in Kasese District, Western Uganda. Materials and methods: Ethylenediamine tetraacetic acid-containing plasma samples and serum samples were taken from pregnant women attending the antenatal clinic. The blood groups were identified using the microplate grouping method, while the presence of anti-D alloantibodies was detected by the indirect antiglobulin test (IAT). Data were also collected from the pregnant women on the risk factors associated with anti-D alloantibody formation. Results: Among the 726 participants, the blood group distribution was as follows: O: 356 (49.%); A: 190 (26.%); B: 152 (21%); and AB: 28 (4%). A total of 28 (3.86%) pregnant women were RhD negative. Anti-D alloantibodies were detected in 88 (12.1%) of the participants; and of these, 13 (14.8%) were RhD negative. Statistically significant risk factors for anti-D alloimmunization included miscarriage, stillbirth, and postpartum hemorrhage. Conclusion: Blood group O was the most common among the pregnant women in this study and the prevalence of Rh negativity was 3.8%. The frequency of anti-D alloimmunization among pregnant women in Kasese District was 12.12%, with 85.5% of these being RhD positive. Risk factors such as a history of stillbirths, miscarriages, and incidence of postpartum hemorrhage were significantly associated with anti-D alloimmunization. There is a need to routinely carry out antenatal blood grouping and IAT screening on pregnant women in Uganda to detect anti-D alloimmunization. Given the high prevalence of anti-D alloantibody formation among RhD-positive women, we recommend additional research studies on the role of autoimmunity among antigen-positive women, as well as the occurrence of RhD variants plus their implications on hemolytic disease of the fetus and newborn, in Uganda. Although most people are either D+ or D−, there is a plethora of D variants, often categorized as either weak D or partial D. DVI is the D variant most commonly associated with anti-D production. Weak D types 1, 2, and 3 are rarely associated with alloanti-D production, so a policy recommendation would be to treat patients with those D variants as D+, patients with all other D variants would be treated as D−.4 These variants can lead to alloimmunization in RhD-positive pregnant women and the proportion of these variants is not established in Uganda. Routine antenatal RhD and alloanti-D screening among women is a tool used in identifying significant maternal risk factors putting the neonate at risk of HDFN. This should then be followed by the administration of anti-D prophylaxis dose antepartum at the 28th week of gestation and a postpartum injection of anti-D within 72 hours of delivering an RhD-positive infant.5,6 However, in Uganda, there is no routine screening for maternal alloimmunization. Hence, we carried out this study to assess the level of alloimmunization within pregnant women in western Uganda. A total of 726 pregnant women attending the antenatal clinic at the Kagando Hospital, Bwera Hospital, and Nyabirongo Health Centre IV in Kasese District, Western Uganda, were recruited into the study. Participants consented and the study was approved by the research and ethics committee of Mbarara University and by the Uganda National Council of Science and Technology. Whole blood (4 mL) was drawn by venipuncture of the antecubital vein into plain and ethylenediaminetetraacetic acid-containing vacutainer tubes. Samples were analyzed for ABO and RhD blood groups using the microplate method after dilution of red blood cells to a 5% suspension with 0.9% (w/v) saline and adding the grouping antisera appropriately. These were then vortexed, and the presence or absence of agglutination was checked for. The indirect antiglobulin test (IAT) was performed, which involved the incubation of standard cells with the test serum at 37°C for 30 minutes and then reacting with anti-human globulin to bring about agglutination of the red cells in positive samples. The information was recorded using data collection forms. Data were then entered using the statistical software package EXCEL 5.0 (Microsoft, Redmond, WA, USA) and transferred to STATA 12 (StataCorp, College Station, TX, USA) for analysis. Descriptive statistics (mean, median, interquartile range, and standard deviation) were used and the proportions calculated for categorical variables. Categorical data were analyzed using bivariate and multivariate comparisons. The P-value was set at ≤0.05 to be considered statistically significant. The participants had an age range of 15–42 (median: 24, IQR: 20, 30) years and there were 160 (22%) prime gravid women. Complications reported in the present pregnancy included malaria, bleeding, and HIV. 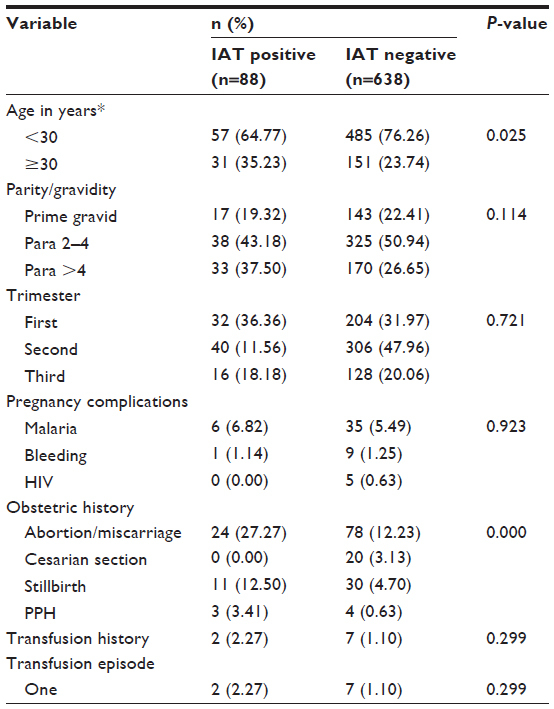 A total of 170 women (23.4%) had a previous obstetric history of abortion (14%), cesarian section (2.75%), stillbirths (5.65%), and postpartum hemorrhage (PPH) (0.96%). Nine women (1.24%) had a history of blood transfusion. Most of the participants had blood group O (356; 49.04%), with women of other blood groups as follows: A: 190 (26%), B: 152 (21%), and AB: 28 (3.86%). A total of 28 (3.86%) participants were RhD negative. There were 88 (12.1%) IAT-positive participants, and of these, 13 (14.8%) were of RhD-negative status and 75 (85.2%) were RhD positive. There was an association of obstetric history, parity, and gravidity with alloimmunization. Thus, 43% had a parity of two to four children, while 37.5% had a parity of more than four children; the remaining participants were prime gravid women. A bivariate analysis of risk factors closely associated with RhD alloimmunization showed that obstetric history, age, and parity/gravidity had P-values of 0.001, 0.025, and 0.114, respectively, thus being significantly associated with alloimmunization. In all the pregnant women, a positive association was common with obstetric history (P-value: 0.0001) and transfusion history (P-value: 0.2966). There was no association with factors such as HIV and cesarian section generally. Factors such as abortion/miscarriage, stillbirth, and PPH in obstetric history had a close association. Age category (>30 years) showed a significant association with anti-D alloimmunization (P-value: 0.004) (Tables 1 and 2). Abbreviations: CI, confidence interval; COR, crude odds ratio; OR, odds ratio; PPH, postpartum hemorrhage. Abbreviations: HIV, human immunodeficiency virus; IAT, indirect antiglobulin test; PPH, postpartum hemorrhage. RhD alloimmunization has been a focus of concern for obstetricians and hematologists for centuries in their quest to try and eliminate HDFN as a common obstetric problem. The alloanti-D antibodies arise following sensitizing factors such as pregnancy when a RhD-negative woman conceives a RhD-positive fetus, transfusion of RhD-positive blood to RhD-negative woman, and obstetric sensitizing factors such as abortion, ectopic pregnancy, and hemorrhagic episodes in RhD-positive women, and this phenomenon has remained a problem leading to HDFN.7 In this study, the focus was on both RhD-positive and RhD-negative pregnant women; we wanted to determine the ABO blood group distribution, test for the presence of alloantibodies, and establish the associated risks. Our study established a distribution of the ABO blood group, with group O (49%) having the highest percentage, followed by A (26%), B (20.9%), and AB (3.9%). This is similar to the result of the study carried out in Kampala, Uganda, where the blood group distribution was 48.9%, 26.4%, 21.0%, and 3.8% for the blood groups O, A, B, and AB, respectively,8 but differing greatly from the distribution among the Loe population of the Lao Republic, with distributions as follows: O 37.7%, B 35.6%, A 19.9%, and AB 6.0%. This is because of the ethnic variation. A total of 88 (12.12%) participants tested positive, indicating the presence of the antibodies. This indicated a higher prevalence of these antibodies in relation to the results of a similar study8 conducted in Kampala, wherein a prevalence of 5.5% was obtained. Among the 88 participants who were IAT positive, 75 (85.2%) were RhD-positive pregnant women, indicating the development of alloantibodies within the RhD-positive women, which could mainly be due to RhD variants within the population or, to some extent, due to autoimmunity triggered by anti-RhD antibody coating the erythrocytes, and this need to be verified further. In the RhD-positive pregnant women, a strong association was obtained with the obstetric history (P=0.0001). 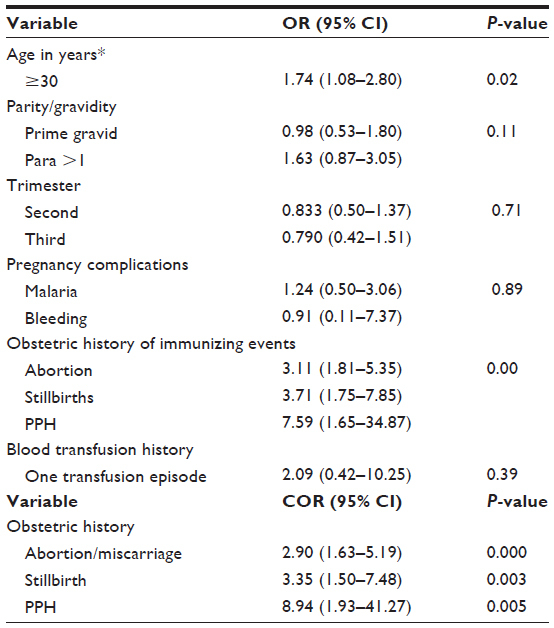 It is therefore indicative that risk factors such as miscarriage, stillbirth, and PPH (P=0.001, 0.002, and 0.012, respectively) play a key role in RhD alloimmunization in RhD-positive pregnant women as in the RhD-negative women. Other factors such as transfusion history and having blood group O had a mild association, but this was not strong enough to be strongly linked. This could be that few pregnant women report having been transfused or could not remember. Blood group O-positive is the most prevalent blood group among pregnant women attending antenatal clinics in Kasese District and the prevalence of Rh negativity was 3.8%. The prevalence of Rh alloimmunization in pregnant women was found at 12.12%, with 85% of these women being RhD positive, which is higher than that reported in similar studies in Kampala. Risk factors such as stillbirth, miscarriage/abortion, and PPH had a close association with alloimmunization. The implications of our findings are limited given the deidentified nature of the specimens tested and lack of follow-up data on the newborns of these women. Consequently, this study only showed the presence of demonstrable alloantibody, but it would be necessary to establish the frequency and specificities of demonstrable clinically significant antibodies that may cause HDFN or require compatible blood for transfusion among pregnant women and their neonates in Kasese. It demonstrates the feasibility of establishing the blood group type and screen testing for RhD alloantibody in a health care setting. The authors wish to thank the study participants. We are grateful to the Medical Education Partnership Initiative–Medical Education Services for All Ugandans (MEPI–MESAU) consortium. This work was supported by grant number 5R24TW008886, supported by Office of the US Global Aids Coordinator, National Institutes of Health, and Health Resources and Services Administration. Its contents are solely the responsibility of the authors and do not necessarily represent the official views of the supporting offices. YM participated in study conception and design, data acquisition, analysis and interpretation, manuscript drafting and revising. EM participated in data collection, analysis and interpretation, manuscript drafting and revising. GM participated in study design, data analysis and interpretation, manuscript drafting and revising. BN participated in study conception, design, data analysis and interpretation, manuscript drafting and revising. John G. Wintrobe’s Clinical Haematology. Vol 1. 11th ed. Netherlands: Wolters Kluwer; 2008:804–805. Avent ND, Reid ME. The Rhesus blood group system. J Am Soc Haematol. 2000;95(2):375–387. Daniels G. Variants of RhD current testing and clinical consequences. Br J Haematol. 2013;161(4):461–470. Gajjar K, Spencer C. Diagnosis and management of non anti-D red cell antibodies in pregnancy. Obstetr Gynaecol. 2009;11:89–95. Kumar S, Regan F. Management of pregnancies with RhD alloimmunisation. Br Med J. 2005;330:1255–1258. Marek L. Prevention of alloimmunisation in RhD negative women. Biomed Pap MeFac Univ Palacky Olomouc Czech Repub. 2010;1(154):3–8. Eipl K. Seroprevalence of unexpected red cell antibodies among pregnant women in Uganda. Immunohematology. 2012;4(28):115–117. Natukunda B, Mugenyi G, Brand A, Schonewille H. Maternal red blood cells alloimmunisation in south western Uganda. Transfus Med. 2011;21(4):262–266. Bondagji NS. Rhesus alloimmunization in pregnancy. A tertiary care center experience in the Western region of Saudi Arabia. Saudi Med J. 2012;33(6):688. Erhabor O, TC A. Rh alloimmunization in Sub Saharan Africa. Int J Womens Health. 2010;2:429–437.